Play Or Daw Your gaming headquarters!!! 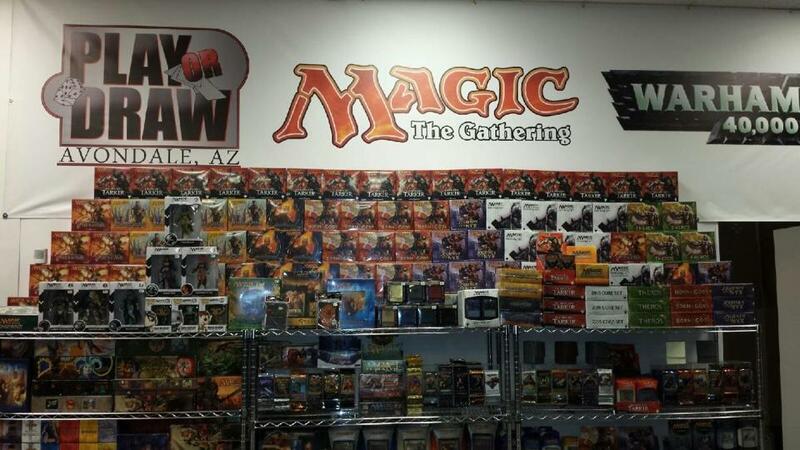 Play or draw is a game store located in Avondale AZ (near Phoenix) We have a very large store with a very large and comfortable play area that is always open for anyone to use for ANY GAME! All gamers are welcome! Our hours have changed, we are now closed on Wednesdays and Thursdays.For our most up-to-date hours and how to reach us, please visit our events page. We focus on Magic the gathering but also carry a huge range of other gaming including : Warhammer 40k, Yugioh, Pokemon, D&D, Pathfinder, and a massive selection of board games! As for magic we always try to have 100% of all magic cards in stock at all times! That is obviously impossible but we come close! If you ever need a card just call or come in! We are known for running large events with huge payouts! Look us up for your next FNM, Star City game night, Star city invitational or even regional! We have some exiciting large events coming this summer including DBZ regionals, check out our events section for pre-registration and more information.